My name is Kelly and I am a late-night snacker. There, I said it. The problem with this – besides the ramifications to my waistline – is that our pantry has no lighting, so my solo evening cookie searches are conducted in the dark, which makes this whole image of me binging on cookies at 10 pm at least four times more pathetic. Better fix that. Sorry about the blurry photo, but I like to maintain some mystery around here, so you’ll just have to wonder whether those peanut butter jars are creamy or crunchy. It’s against code regulations to install an incandescent lightbulb in a closet that small… which we might ignore if my dad wasn’t actually a home inspector, who likes to comment on code violations in restaurants and at other people’s homes. So if we installed an illegal bulb which burned down our entire house, I couldn’t go running home to mom and dad, and besides, they might not have any cookies. Time to come up with another solution. 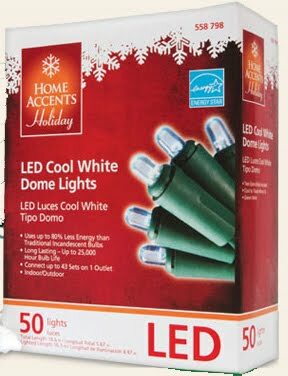 Enter these guys: LED Christmas lights we snagged for $2.50. We also picked up a motion-sensing lightswitch from a yard sale for 25 cents, and an electrical outlet box for a dollar. Total invested: $3.75. 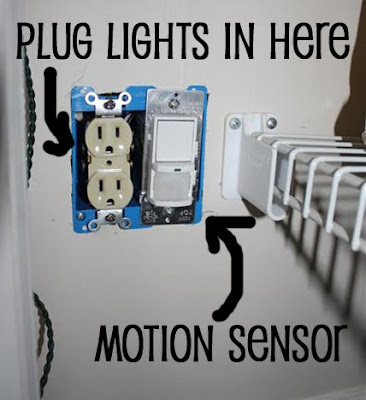 Because it’s motion-sensing, it only turns on when you open the pantry door. So once it’s installed, you close the pantry door, then OPEN IT REAL QUICK to try to catch the light coming on. You can’t. It’s QUICK. Because the lights are installed all around the outside edge, the effect you get is this techno blue glow which evenly lights the whole pantry. Whereas if we’d installed a lightbulb in the ceiling, it would mostly just light the top shelf, casting shadows down to the bottom, and you’d have to store your cookies on the top shelf at all times. I think it’s a pretty solid solution to a very critical problem for under four bucks. And there is one of each, by the way. Peanut butter jars that is: a creamy and a crunchy. My life is an open book. We just found an AWESOME new lighting solution that might’ve worked better than this. Check it out here! i love it! we are split down the middle with the crunchy/creamy PB conundrum also. im crunchy. he is creamy. I'm a late night snacker too. I used to have cereal, but now I gravitate more towards…well, cookies. And ice cream. And gummy bears. And all those things you're not supposed to eat late at night. You are way too darned smart. That is a brilliant solution…I mean really brilliant. As for late night snacking, I am a fan. I usually have a glass of wine AND a snack making it twice the necessary calories. Great idea. Using xmas tree lights for this seems to be a great solution. A few comments though regarding the electrical aspect of this. “He brought in some electrical wires from a nearby switch” is a very loaded statement. How did he “bring” the wires in? Did he fish them through the wall? I ask because that statement over-simplifies what can be a difficult process that can require expensive tools, drilling through studs in your wall, etc. Similarly, “Oh it’s easy! You just hook it up like a regular lightswitch” might make someone with no experience with electrical systems think that they can do this themselves. The truth is – they probably can with the proper tools and research, but my experience has been that most people don’t want to screw around with something that can kill them and burn their house down. Also, it looks like you added a duplex receptacle in addition to the motion sensing switch (which makes sense, because if the duplex receptacle was already in the closet, there wouldn’t have been a need to bring new wires in from a nearby switch). Adding a receptacle on an existing circuit isn’t necessarily safe. Although you can, in theory, add dozens of receptacles to an existing circuit, you won’t necessarily be able to use them all. If all you ever use this receptacle for is the closet lights, you’ll probably be okay. But there’s a chance that you could end up overloading the circuit, especially if you plug other things into that receptacle. Overloading a circuit, at best, will simply trip your circuit breaker. Worst case is that it could start a fire. Also, don’t buy any electrical switch from a yardsale — buy it from a reputable store that sells brand name electrical supplies (look for devices by Hubbell, Leviton, Cooper, etc.). It will only cost a few dollars more, and you’ll have piece of mind knowing that you installed a quality product in your home. If your house ever burns down and your insurance company finds out that you installed a switch that you bought on the cheap from a yard sale — do you think that they’re going to be eager to hand over thousands of dollars to you? Don’t think so. They love finding things like this in people’s homes because it can get them off the hook from having to pay out big bucks. Finally – as a reminder to anyone who wants to try to do this, understand that you need to turn circuit breakers OFF before attempting to pull new wires, or install/remove wiring devices such as switches, receptacles. Household current is enough to KILL and start fires. Don’t screw around with electricity if you don’t know what you’re doing. DirtyHippieBrian, Thanks for your thoughtful comment, and great points! You’re right that this should not be attempted without turning off circuit breakers, using the right tools and knowing what you’re doing. You asked how we brought wires in from a nearby switch. The switch is on the opposite side of the same wall, so it was a straight drop down below to wire in the new receptacle. Like you said, it might have been a difficult process otherwise. I know they do sell battery-powered LED lights that would also work great for this. We’re not concerned about overloading the circuit in this case, because we’re only adding a three-watt LED light and don’t plan on plugging anything else in there. Our yard sale-bought switch is a Leviton that was new in package. We felt confident that it was trustworthy, but you’re right to point out that you should use caution in that case. Andy is experienced in wiring electricity for a house, but if he hadn’t been, we definitely would have approached this differently. I hope no one who reads this will attempt to try it themselves if they don’t know what they’re doing! The battery-powered LED option is a great alternative. Thanks again for bringing up these important points! Nothing wrong with adding additional receptacles as long as it is done per code. Insurance company’s do not look for simple items in a home to deny a claim. You have a contract that says they will replace your loss and that is what they will do, short of arson. If they could deny a claim because you installed a switch you bought at a rummage sale or any other home did project no claims would be paid to anybody. Want to verify? Call your state Insurance Commissioner and ask. Interesting post & idea. A benefit of the low-wattage colored LEDs is that you’re also not blinded in the middle of the night by 40 or 60 watts of light. Just enough to light to read “crunch” on the PB jar. I do find it fascinating every time I read something like this that there is always a “DirtyHippieBrian” who needs to comment on all the dangers and things that could go wrong and how people should be AFRAID because, well.. bad things can happen. Of course bad things can happen. That’s called “life”. But that’s not a reason for someone who knows what they’re doing to avoid doing things that might go wrong for people who don’t. Is this really a country of people whose ancestors hopped onto boats to go hack a life out of wilderness, or wagons to do the same? Sheesh.. It may sound like doom & gloom to tell people to be careful around electricity, but it’s not. I’ve seen some pretty scary things being done by people who don’t have any idea what they’re doing. As long as you’re careful when installing these switches — or get help if it’s something you’ve never done before — they are wonderful gadgets. There are also so battery-operated motion sensor lights that are very bright; the packages show them startling burglars (unlikely) and helping the homeowners get from the car in the driveway to the front door on a well-lit path. I do use one of those as a flashlight when I walk the dog at night. 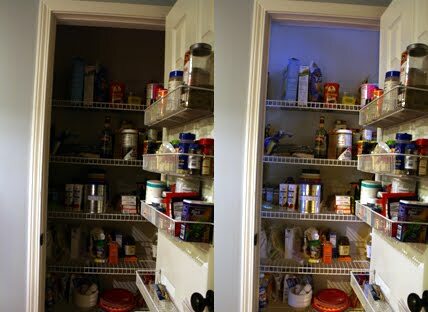 Thanks for a great idea for lighting the pantry! very cool – what a steal with that yard sale motion sensing lightswitch! Thanks for the great idea! Unfortunatly I am in an apt. so any electrical work isnt possible. I found battery operated LEDS with a manual on/offswitch I will mount at the pantry opening. It lumens are probably not as strong as your 110v solution and no motion but hopefully will be suffficiend to see the cookies 🙂 and I wont forget to turn them off. Enjoy your blog…Another solution for pantry is an automatic switch that’s located in the door jamb. It’s wired to the light. Every time the door opens the light comes on. Pretty simple.